Prostaglandin E2 (PGE2) potentiates healing and regeneration of several types of tissues and supports the expansion of stem cells; therefore, it could be beneficial in a variety of clinical settings, such as stimulating recovery of the hematopoietic system after bone marrow transplantation and promoting gastrointestinal epithelium healing and repair in cases of inflammatory bowel disease (IBD). However, PGE2 is quickly degraded by the enzyme 15-hydroxyprostaglandin dehydrogenase (15-PGDH). To prevent degradation and increase PGE2 levels for therapeutic purposes, we are developing potent inhibitors of 15-PGDH and optimizing them for chemical stability, biological activity, and solubility. Our analogs display low nanomolar inhibitory activity against 15-PGDH and increase PGE2 levels in cells and in vivo. I remember learning about the Green Fellowship as a freshman and thinking, "Wow this sounds difficult. No way could I do research." Funny how things work out, right? Ask questions and seek answers. Do as young children do – never stop asking, "Why?" Some students know they want to participate in the Green Fellowship from the very start of college, planning their semesters around this one semester of full-time research. Other students, like myself, have no intention of participating in the program until about a month before the application is due during their senior year of college. I remember learning about the Green Fellowship as a freshman and thinking, "Wow this sounds difficult. No way could I do research." Funny how things work out, right? Overall, the Green Fellowship was a fantastic experience, and I'm so glad that I took part in the program. I was close to passing up the opportunity because it meant delaying my graduation date a full year, but after some consideration, I decided there were more pros to participating in the research program than cons. 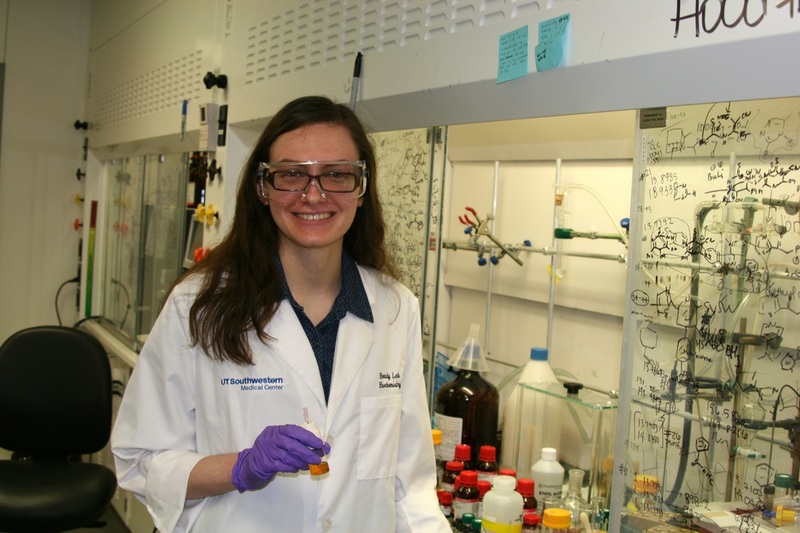 I was placed in Dr. Ready's medicinal chemistry lab, and my project involved synthesizing analogs of a biologically active small molecule. Being a chemistry major and organic chemistry Peer Tutor, I had seen plenty of reactions and multi-step syntheses written on paper prior to this experience. 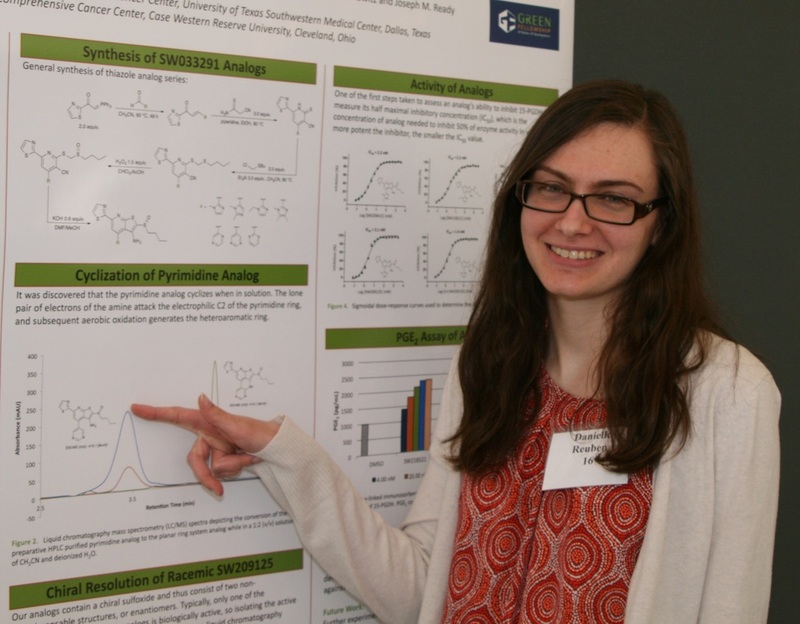 Through the Green Fellowship, I was able to take reactions I had only previously done on paper to the bench, using the reactions to make compounds that could possibly be used to treat patients in the future. This was very cool to me. One of the many reasons why this was such a positive experience for me was because of the people that I worked with. My coworkers were all very helpful and encouraging throughout the entire process. My PI and UTSW mentor were patient with me and answered any questions that I had in relation to the project. It took me about two months to get used to working in the lab and learn the techniques needed to make my products. By the last two months, I was going through the five to six step syntheses of my analogs with much less supervision, and I enjoyed making decisions about how I wanted to do things. This program helped me learn more about myself and what I want in my future career. Some of your experiments will likely flat out fail. There, I said it, and I hope this doesn't discourage or scare you. Don't be afraid of having an experiment that fails or of making mistakes in lab. It happens to newbies and research veterans alike. When it does happen, know that your PI and coworkers are there to help you problem solve and learn from your mistakes. Research wouldn't be research if everything worked out perfectly as planned all the time. ​Finally, ask questions and seek answers. Do as young children do – never stop asking, "Why?"